A picture paints a thousand words, or so they say; but what about a picture made of words? 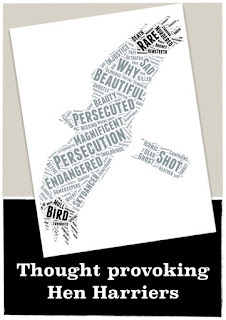 Earlier in the year I posted a blog titled Those Thought Provoking Hen Harriers. 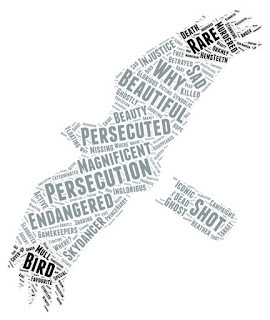 That blog captured the thoughts and feelings people had when they first saw a Hen Harrier (and it's well worth another read). 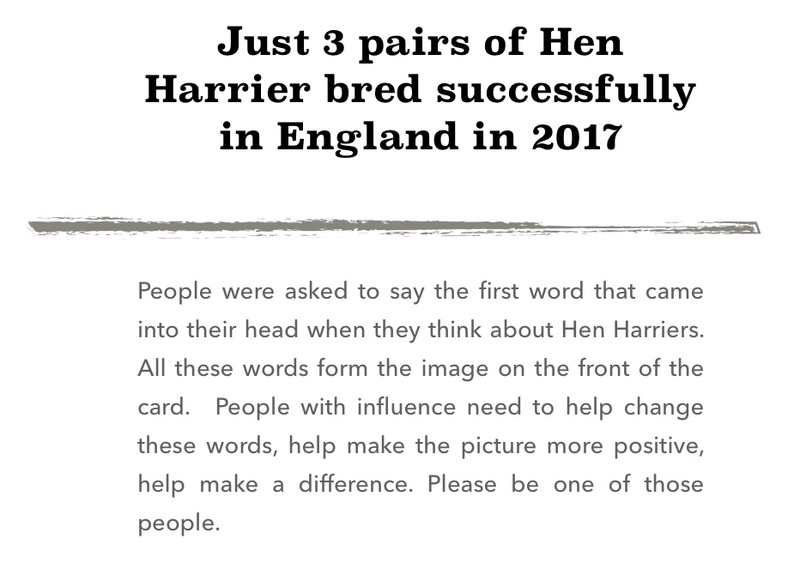 What you don't know from the blog is that I also asked those people for the first word that came into their head when I said the words "Hen Harrier". I asked the question on twitter too and received over 150 words from a broad range of people. A massive thank you of course to all those people who took part. And what an interesting picture it paints. The largest words are the ones that were said the most. I couldn't let these words go to waste of course, I had to find a way to use them.....in fact a way for all of us to use them. I don't want any money for them, all I want is for the Hen Harrier story to keep being told and for awareness to build. So if you would like a card to send to a group or individual, then please email me your address (findlaywilde@gmail.com) and I will send you some cards. If they all get used up, I will happily get more printed. 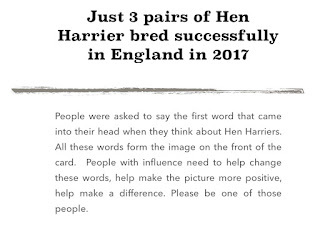 You must of course add you own message in the card and talk about how you feel about just 3 successful breeding Hen Harrier pairs in England this year. So who would you send them to; MPs, landowners, NT estates, upland estates, parish councils, rural police groups......the list goes on. The picture will only turn more positive if we all keep the pressure for change building. Hi Yam. Once or twice each year I visit an area of Scotland which has major areas of moorland owned by several large estates, most of which have an appalling record as far as raptor persecution is concerned. Whilst I do occasionally see Hen Harriers, these habitats should support large numbers of this species, and other raptors too. I think, therefore, that referring to Scotland as a 'safe haven' is a bit of a red herring. I get the impression that things are just as bad, if not worse, north of the border. Well said, Richard. There is no room for complacency. Scotland's hen harrier population is declining and declining particularly over grouse moors - as we all know. Scotland is not a safe haven. Maybe Orkney could be referred to as one but not the Scottish mainland. Scotland is certainly not a safe haven. 55-74 females Hen Harriers are killed each year which is 11-15% of the UK population of breeding females and that figure does not include males or immatures. Etheridge, B., R. W. Summers, and R. E. Green. “The Effects of Illegal Killing and Destruction of Nests by Humans on the Population Dynamics of the Hen Harrier Circus Cyaneus in Scotland.” Journal of Applied Ecology 34.4 (1997): 1081-105. http://www.jstor.org/stable/2405296? You are all right, mainland Scotland is most definitely not a safe haven; in Orkney Hen Harriers are generally safe from human persecution. However, all ground-nesting birds on Orkney now have to contend with the stoat, allegedly accidentally-introduced around 2010 and now prolific across virtually all of the Orkney Mainland island. For raptors like the Hen Harrier, their main prey item, the Orkney Vole, is also taken by the stoat creating a double impact. Scottish Natural Heritage has taken 7 years to reach the point of commencing trapping trials in which time the population has gone from one litter to thousands. It is not a rosy picture for the Hen Harrier even here. Sorry that wasn't intended at all. Just wanted to add clarity. After reading this post, as I live in an area which would not in the main be good Hen Harrier habitat, my thoughts turned to sending these cards to some of the major Scottish estates that I visit where the Hen Harrier population is way below what it should be considering the amount of suitable habitat there is. However, I decided that, given their record (basically, they don't give a toss), any such message would fall on deaf ears. I shall, therefore, send them to people who I believe can make a difference, and who have to consider what the public think of their 'organisations'. I'll give it some thought, but my local MP and Helen Ghosh (although I suspect that she too has deaf ears)immediately come to mind. I'll be in touch later. Just seen that Helen Ghosh is quitting the NT in spring next year, so I guess she'll be free-wheeling until then! Finn - these are fantastic cards - what a great idea. Well done you continuing to raise awareness of the plight of these species. It's true what they say about the hen harrier being emblematic of all that is wrong in our uplands. I think only land reform will change this - if the estates no longer have control over our land we can make sure it benefits all species - not a greedy minority of 'human)?)' beings. Brilliant, brilliant stuff. More power to you. Finn, cool design. Do you have an online version that I can post on LinkedIn to spread the word. A link to your spot or somewhere that people could learn more would be nice. Nice work Findlay. You are a great champion of harriers and all birds of prey. I hope you are closely watching the case of the Bowland gamekeeper? Pleas send some of your Linnets for our ringing project. You are so clever! I hope you do well with this project! You are such a great advocate for them. Thats a great image - I like it. Hope all is well and that you get some time off from the studies to track down a few winter visitors. Not sure if Orkney HHs are safe as ringing returns show birds found in England. Satellite tagging of birds on Mull show movement to mainland and new birds arriving.